An American company named JBLU, Inc. (JBLU) sells jeans under the name C’est Toi Jeans USA. 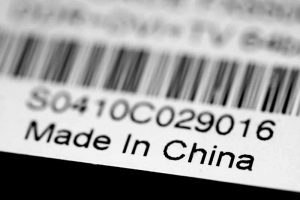 While the term, “USA” is clearly in the brand name, these jeans are not in fact manufactured in the United States – they are made in China. Inside the jeans sold under the C’est Toi Jeans USA name, you can find a label which indicates that the jeans are made in China. US Customs, using its regulatory authority, created a set of regulations that indicate the use of “USA” or “America” on imports is likely to create confusion as to the source of the goods. In these cases, US Customs determined that the country-of-origin must be made even more conspicuous (i.e., placed near the “USA” or “America” symbol or text, and in equivalent size). However, the regulations are generally more relaxed when “USA” is part of the trademark name. In JBLU’s case against US Customs related to their jeans, the US Court of International Trade (CIT) sided with US Customs officials, and ruled that JBLU must meet the more stringent standard (which their jeans failed to do). However, on appeal, the Federal Circuit reversed that CIT ruling. At the Federal Circuit appeal, the key issue is the interpretation of the term “trademark” as used in the customs statute. The CIT interpreted the word to be limited only to marks that are registered U.S. trademarks, or those subject to a registration application in the USPTO (US Patent & Trademark Office). On appeal, however, the Federal Circuit reversed that finding and instead applied the broader definition found in the Lanham Act (US trademark law) including, “any word, name, symbol, or device or any combination thereof adopted and used by a manufacturer or merchant to identify his goods and distinguish them from those manufactured or sold by others.” (15 U.S.C. § 1127). In making this determination, the Federal Circuit chose to give no deference to the US Customs interpretation of its own regulations because the term “trademark” as used in the regulation, “unambiguously includes federally registered and common law trademarks.” (Emphasis added). The Federal Circuit noted that where a regulation is clear on its face, no deference is given to the enforcing agency’s interpretation, and the law is interpreted in accordance with its unambiguous meaning. (citing to Viraj Grp. v. United States, 476 F.3d 1349 (Fed. Cir. 2007)). Doing otherwise would essentially allow the agency to create its own new regulation, the Federal Circuit indicates. On remand, the CIT will now act as a trademark court to determine whether the C’est Toi Jeans USA counted as a trademark back when the imports occurred. JBLU has since applied for trademark registration on the brand.